The cheapest way to change education in Alaska? Give every student a tablet. A former Apple executive thinks providing every student in Alaska with a tablet computer is possible in the near future — with enough funding. Bob Whicker used to work as in education development for Apple Computer. 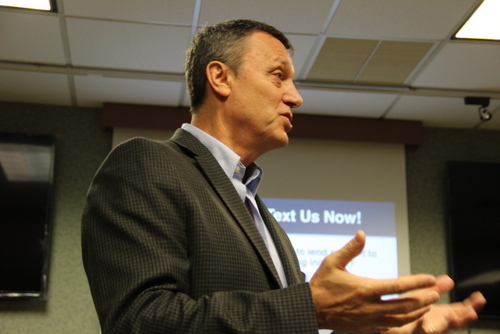 Now, he’s the director of the Alaska Association of School Board’s Consortium for Digital Learning, or CDL. https://www.kcaw.org/wp-content/uploads/2013/11/21ONETOONE.mp3 Listen to iFriendly audio. Whicker outlined a strategy for the so-called 1:1 (one-to-one) Digital Initiative for the Sitka Chamber of Commerce this week (11-20-13). Whicker’s roots in Silicon Valley were evident throughout his presentation, which was peppered with terms like “beta”, and through the live demos of eReaders. So what we’ve done with this book we got Shelly, she’s a whale biologist, and then we’ve added narration to it. So that helps kids as they’re reading this book. We’ve also made it so that it can change into different levels of reading. So this would be for an earlier reader, but it’s the same content. So teachers can be using this with a broad range of kids within their classrooms. Whicker says it’s not just about supplying the devices. Results depend on the content and creative ways teachers can craft lesson plans using the devices. He says interactive digital content allows teachers to cater their lessons to a broad range of students. It’s about the cheapest way to change education there is. If I wanted to really make things happen and if I want to get to a teacher ratio that would really change things I would have to dramatically change the structure of my school to get there. A $5 million state legislative grant started the initiative in 2004. Whicker says that in order for the 1:1 initiative to realize its full potential it needs a total of $15.6 million from the state and a $9.6 match from local districts, allocated over four years. Nevertheless, Whicker says over 140 school sites across the state practice a preliminary version of 1:1 at a cost of $200 per student – with the state contributing $120 and local district $80. He says teachers report positive changes. We’ve had these 1:1 projects out and about for a while and CDL districts across the state we get teachers reporting to us that student engagement is up, attendance is up, behavior is down, We also see that student achievement can really be affected. This was an iPad project across 9 districts in 2011 and it was aimed at literacy and we saw a doubling of expected gains in literacy by all student and for those student 2.5 years behind in reading we actually saw those scores triple. So I’m not saying that’s going to happen, we’re not guaranteed this, but it’s looking like there is something going on. Sitka School District Superintendent Steve Bradshaw thinks the initiative is appealing because of the cost of replacing outdated textbooks. He believes a digital curriculum could dramatically reduce costs. You hear more conversation about the fact that we are going to have to change almost 100% of our curriculum materials over the next 24 to 36 months because of the new common core standards. That expensive. I’ve thrown out numbers anywhere between two hundred and fifty to five hundred thousand dollars per curriculum subject material. So I have hopes this is some way we can get material in a less expensive fashion. Sitka School Board President Lon Garrison emphasized that $28 million statewide is already being spent on technology into the classroom. While the 1:1 initiative would require additional funding, Garrison feels that if it satisfies schools’ technology needs and increases student engagement and performance, districts should be free to reallocate the existing budget. But, in order for many schools to fully participate they need bandwidth. Sitka’s school board is considering a capital request to the legislature this year to increase bandwidth, primarily to meet the state’s new requirements for online testing. That additional capacity — if the legislature funds it — might make the 1:1 initiative a reality in Sitka.